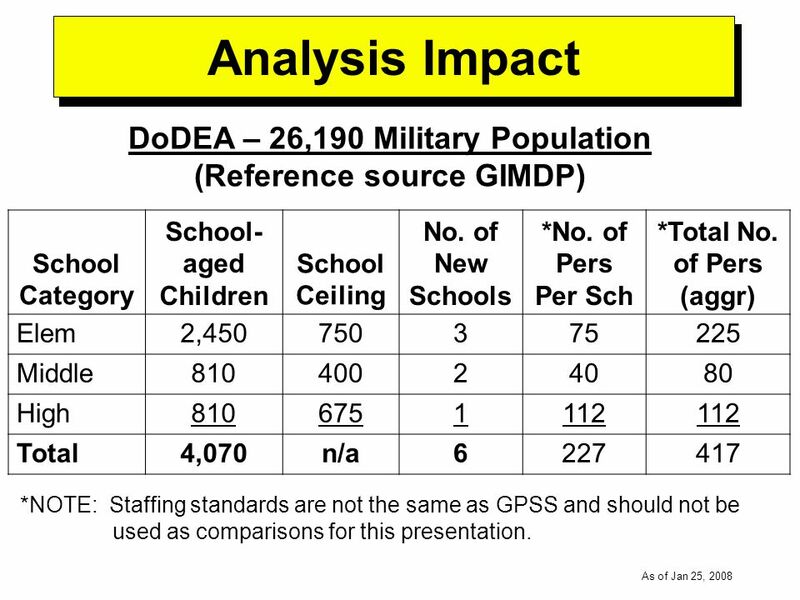 -----DRAFT----- As of Jan 25, 2008 Civilian Military Task Force (CMTF) Education Sub-committee Information Briefing To 29 th Guam Legislature David S.
8 -----DRAFT----- As of Jan 25, 2008 Analysis Impact DoDEA – 26,190 Military Population (Reference source GIMDP) School Category School- aged Children School Ceiling No. of New Schools *No. of Pers Per Sch *Total No. 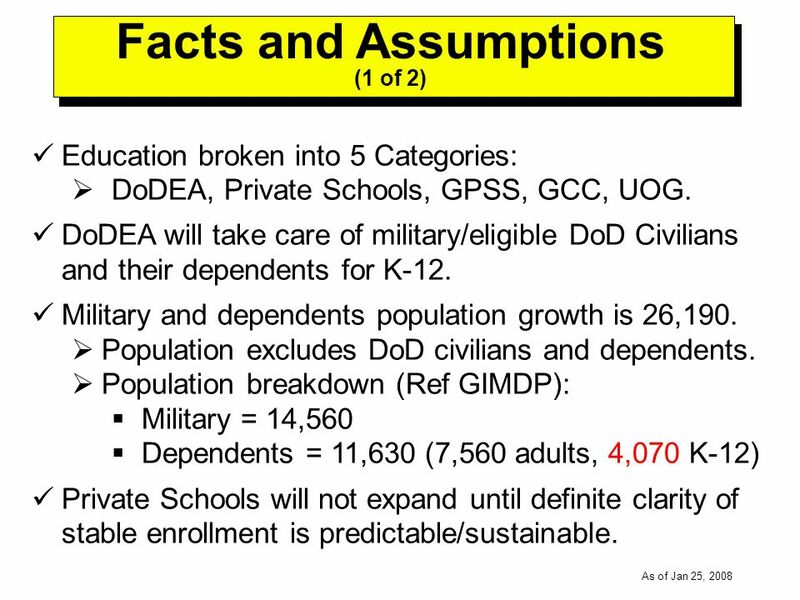 of Pers (aggr) Elem2,450750375225 Middle81040024080 High8106751112 Total4,070n/a6227417 *NOTE: Staffing standards are not the same as GPSS and should not be used as comparisons for this presentation. 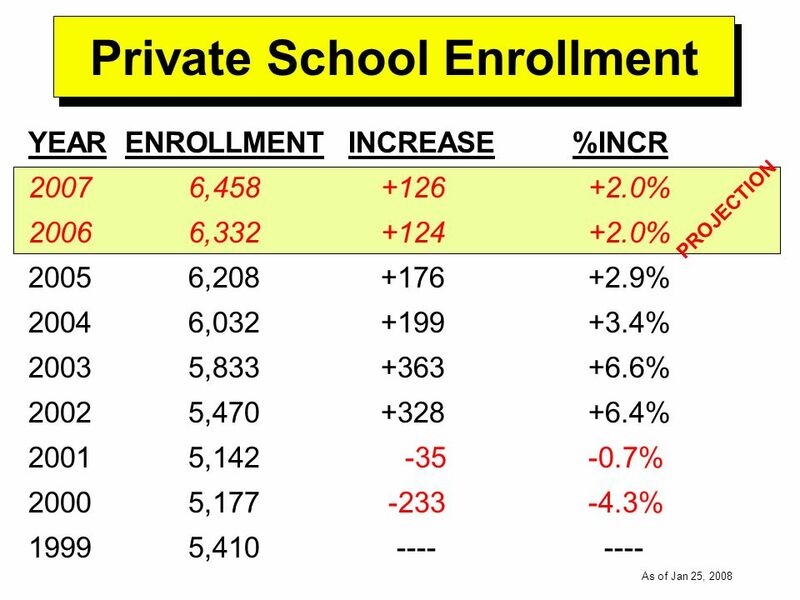 9 -----DRAFT----- As of Jan 25, 2008 Analysis Impact Private Schools In the aggregate, there has been a downward trend of enrollment increases from 6% to 2% between 2001 and 2005. Expansion is not a priority consideration at this time due to uncertainty of a sustained increased enrollment. Enrollment is anticipated to increase, again. However, to what extent is questionable. 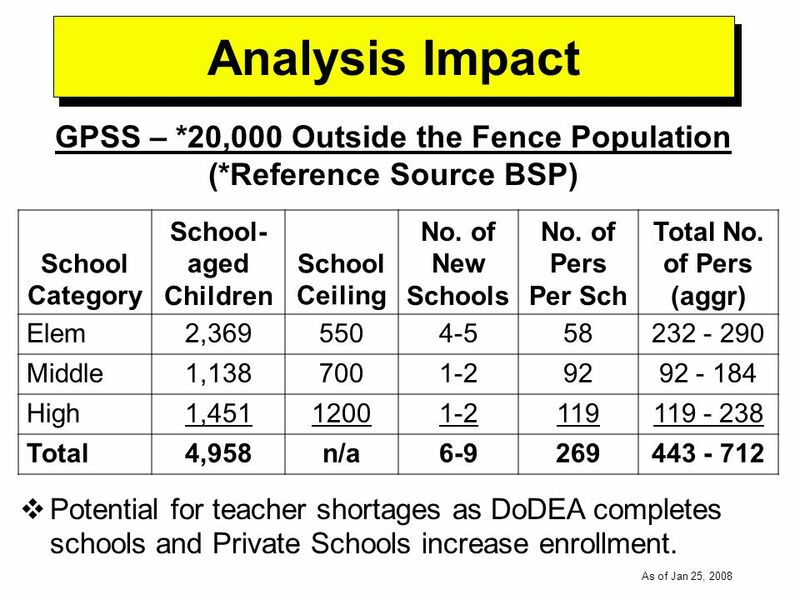 10 -----DRAFT----- As of Jan 25, 2008 Analysis Impact GPSS – *20,000 Outside the Fence Population (*Reference Source BSP) School Category School- aged Children School Ceiling No. of New Schools No. of Pers Per Sch Total No. of Pers (aggr) Elem2,3695504-558232 - 290 Middle1,1387001-29292 - 184 High1,45112001-2119119 - 238 Total4,958n/a6-9269443 - 712 Potential for teacher shortages as DoDEA completes schools and Private Schools increase enrollment. 11 -----DRAFT----- As of Jan 25, 2008 Analysis Impact GCC (1 of 2) Two areas: Post-secondary Education Increased workforce needs for construction trades and other career/technical professions. Increased enrollment of 484 college students. Secondary Education Increased workforce needs for career/technical education - high school. Shortage in core capacity resulting in limited ability to surge. 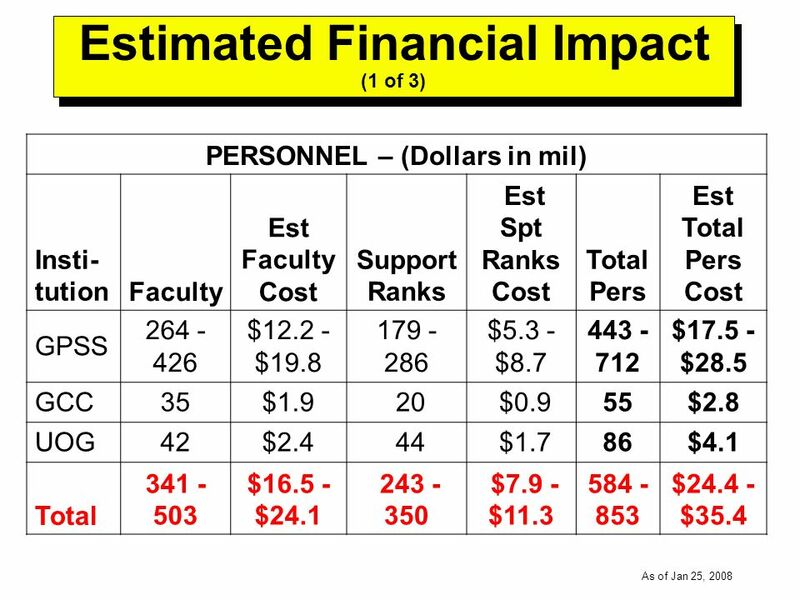 12 -----DRAFT----- As of Jan 25, 2008 Analysis Impact GCC (2 of 2) Reassessing faculty and support ranks increases to support and sustain the additional workforce training requirements. Reassessing post-secondary and secondary facilities for construction and collateral equipment needs. Prioritizing Allied Health and Science building construction as an immediate need. Reinforcing regional collaboration with educational partners. 13 -----DRAFT----- As of Jan 25, 2008 Analysis Impact UOG (1 of 2) Two areas: Degree Programs Increased workforce needs for other professionals currently/not currently offered. Increased enrollment of 745 university students. Environmental & Technical Outreach Increased impact assessment demands on the environment, economy, community, and business areas. Shortage in core capacity resulting in limited ability to surge. 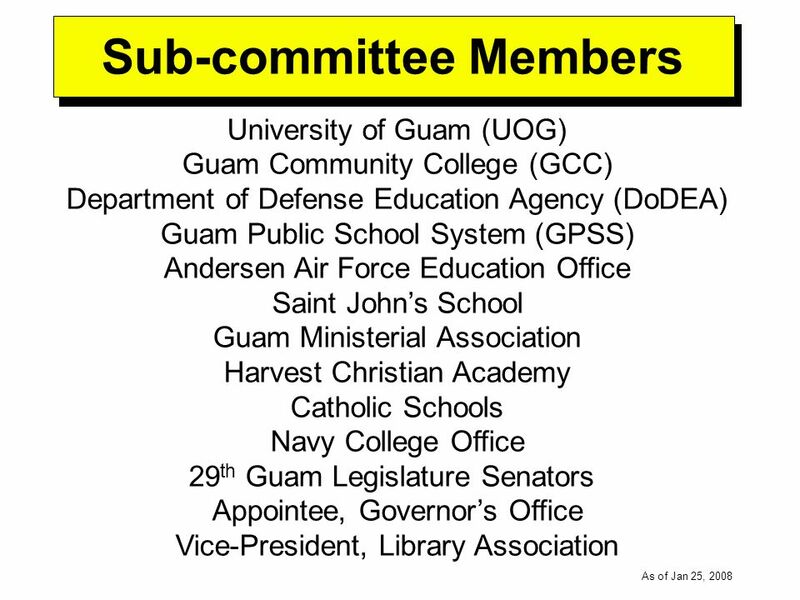 14 -----DRAFT----- As of Jan 25, 2008 Analysis Impact UOG (2 of 2) Reassessing faculty and support ranks increases to support and sustain the additional workforce development requirements. Reassessing facilities for construction and collateral equipment needs. Prioritizing Nursing and CEDDERS building construction as immediate needs. Shifting to seek more federal funding for increased environmental research requirements. 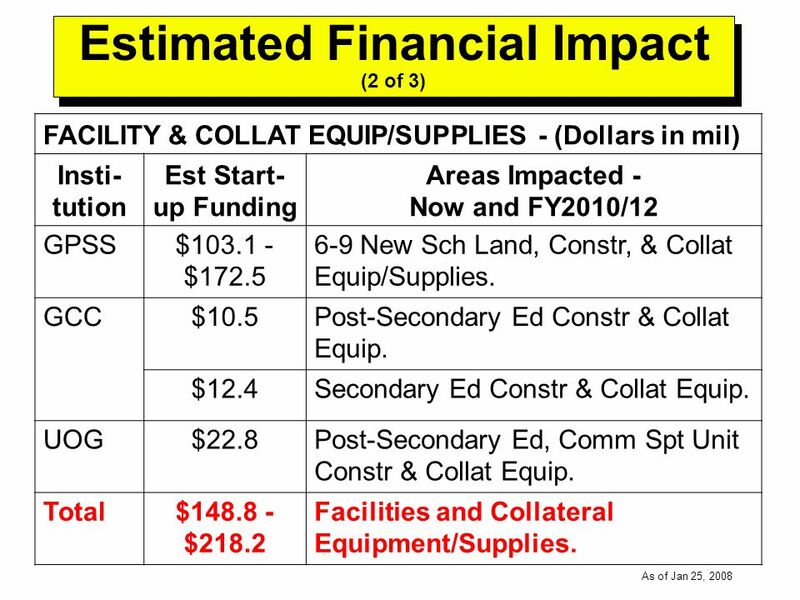 16 -----DRAFT----- As of Jan 25, 2008 Estimated Financial Impact (2 of 3) FACILITY & COLLAT EQUIP/SUPPLIES - (Dollars in mil) Insti- tution Est Start- up Funding Areas Impacted - Now and FY2010/12 GPSS$103.1 - $172.5 6-9 New Sch Land, Constr, & Collat Equip/Supplies. GCC$10.5Post-Secondary Ed Constr & Collat Equip. $12.4Secondary Ed Constr & Collat Equip. 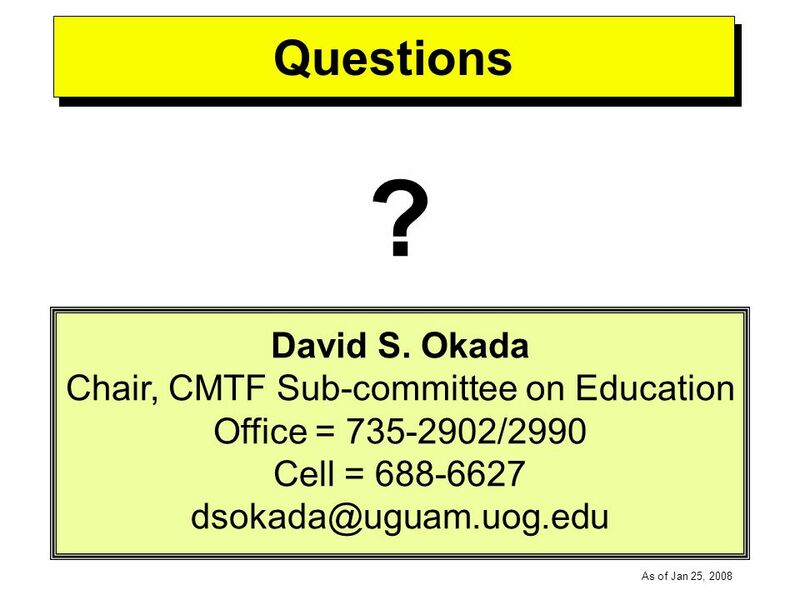 UOG$22.8Post-Secondary Ed, Comm Spt Unit Constr & Collat Equip. Total$148.8 - $218.2 Facilities and Collateral Equipment/Supplies. 18 -----DRAFT----- As of Jan 25, 2008 Issues/Concerns Obtaining more information on type and quantity of workforce needs for GCC and UOG to assess impact. 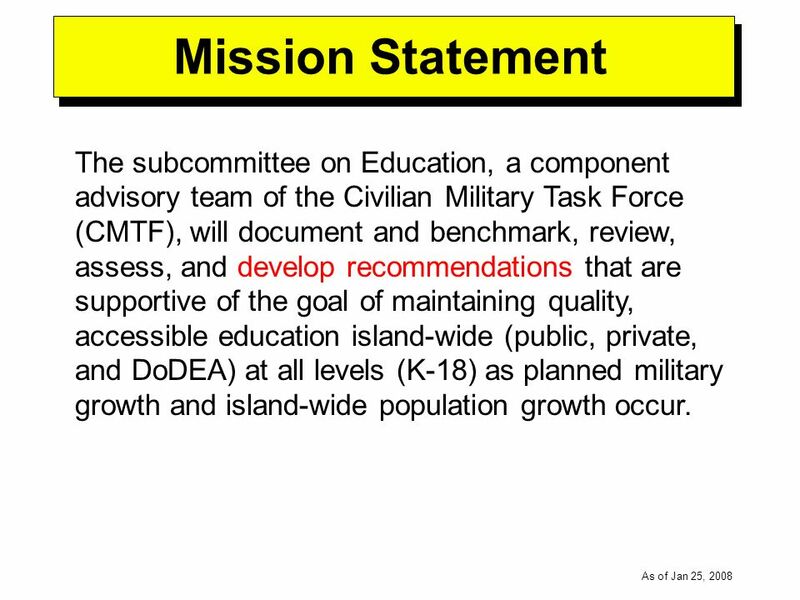 Working on Step 1 action items to close gap with Step 2 of military expansion impacts. 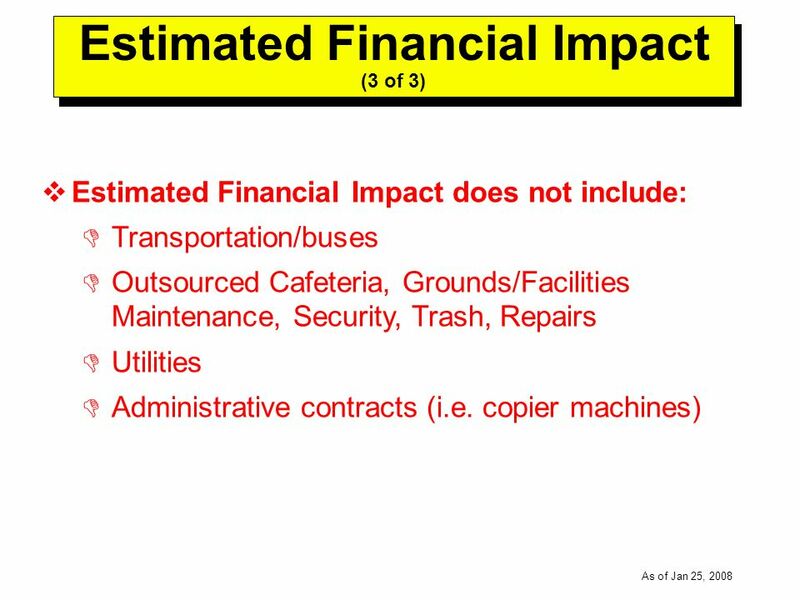 Identifying funding sources to support increases in facilities/personnel. Aligning the timing of producing a trained workforce with ability to hire due to funding shortages. Identifying sustained funding for post-construction increases in facilities/personnel/contracts. 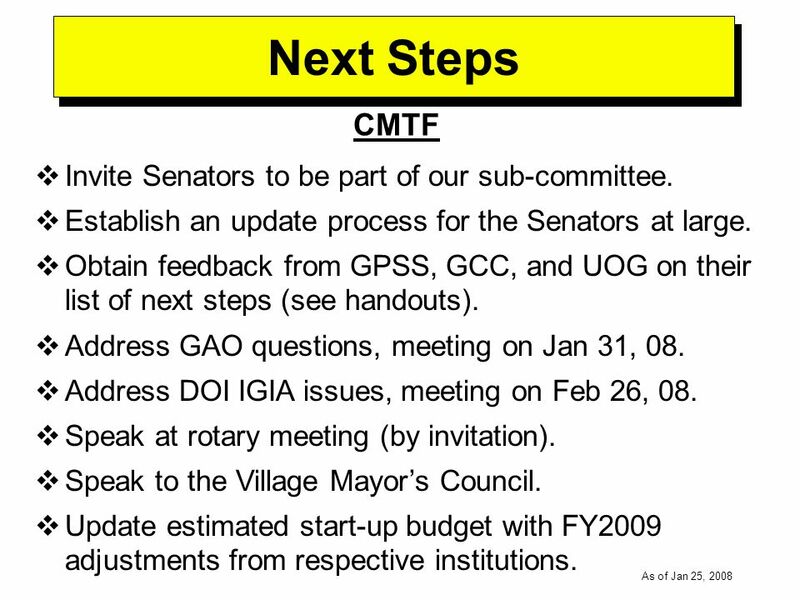 19 -----DRAFT----- As of Jan 25, 2008 Actions to Date CMTF Participates in Labor, HSS, and Environmental sub- committee meetings (on-going). Participates in selected GPSS meetings (on-going). 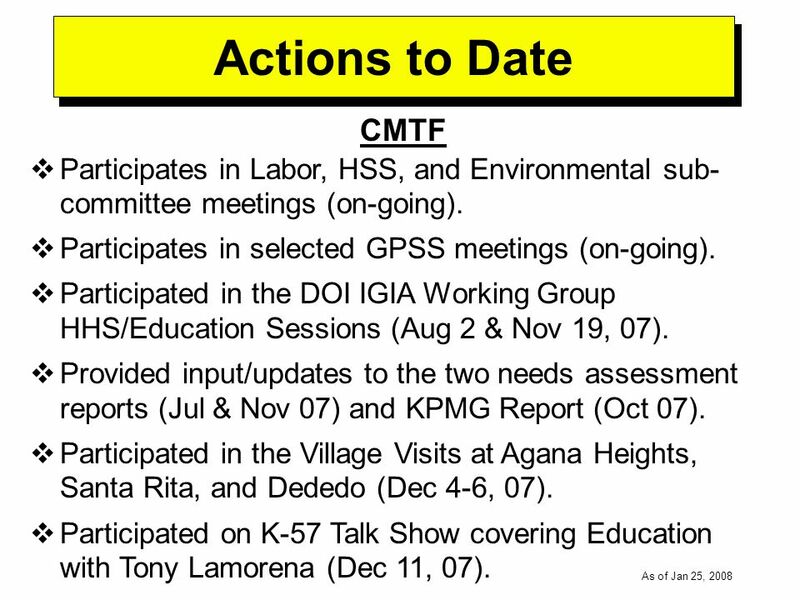 Participated in the DOI IGIA Working Group HHS/Education Sessions (Aug 2 & Nov 19, 07). Provided input/updates to the two needs assessment reports (Jul & Nov 07) and KPMG Report (Oct 07). Participated in the Village Visits at Agana Heights, Santa Rita, and Dededo (Dec 4-6, 07). Participated on K-57 Talk Show covering Education with Tony Lamorena (Dec 11, 07). 20 -----DRAFT----- As of Jan 25, 2008 Actions to Date GPSS Assessing the need to address current issues of priorities to close gap between Steps 1 and 2. Started committee to align career/ technical education back to GCC and expand current MOA. Initiated management audit process. Completing construction projects for three new schools by this year. Identifying personnel, collateral equipment, and funding requirements for new schools. 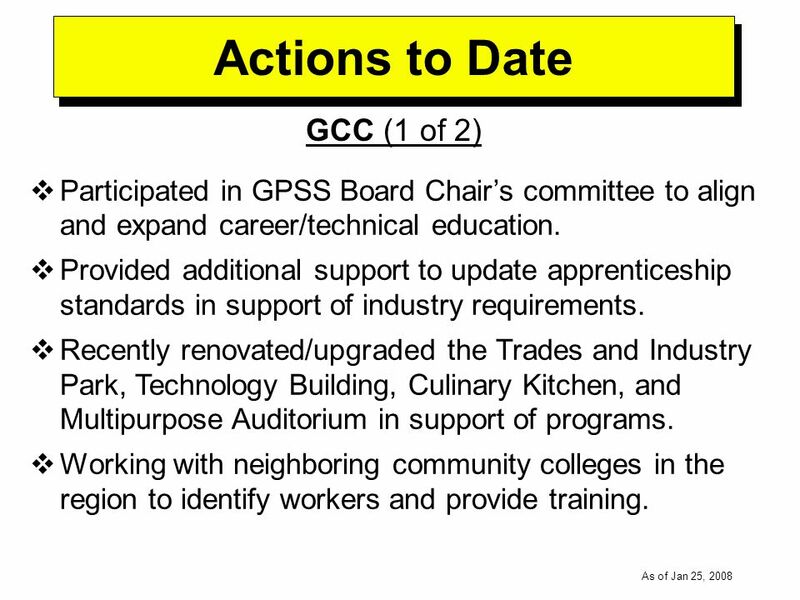 21 -----DRAFT----- As of Jan 25, 2008 Actions to Date GCC (1 of 2) Participated in GPSS Board Chairs committee to align and expand career/technical education. Provided additional support to update apprenticeship standards in support of industry requirements. Recently renovated/upgraded the Trades and Industry Park, Technology Building, Culinary Kitchen, and Multipurpose Auditorium in support of programs. Working with neighboring community colleges in the region to identify workers and provide training. 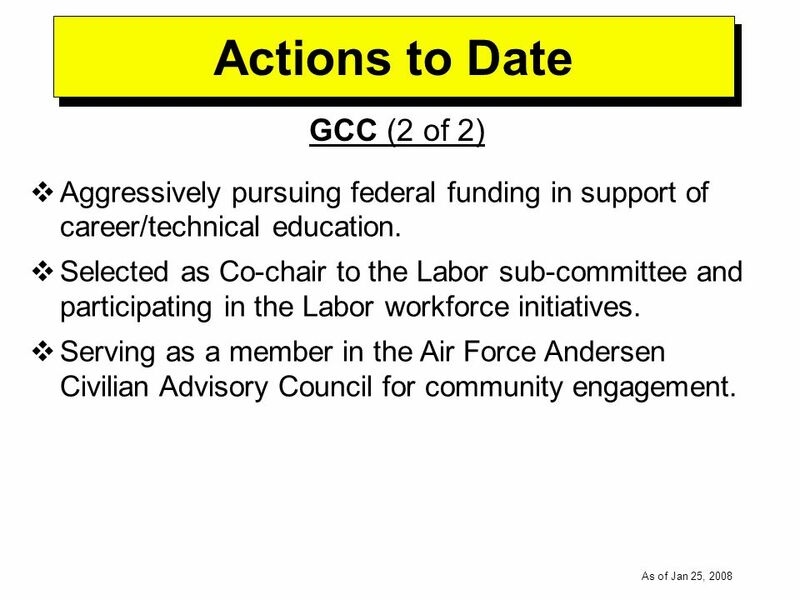 22 -----DRAFT----- As of Jan 25, 2008 Actions to Date GCC (2 of 2) Aggressively pursuing federal funding in support of career/technical education. Selected as Co-chair to the Labor sub-committee and participating in the Labor workforce initiatives. Serving as a member in the Air Force Andersen Civilian Advisory Council for community engagement. 23 -----DRAFT----- As of Jan 25, 2008 Actions to Date UOG (1 of 2) Accelerating construction plans for Nurse and CEDDERS buildings to support allied health workforce. Completed the Leon Guerrero building for additional classroom space in support of degree programs. Streamlined teacher program to produce more teachers for GPSS. Continuing to provide assessment impacts on the islands environment, economy, community, and businesses. 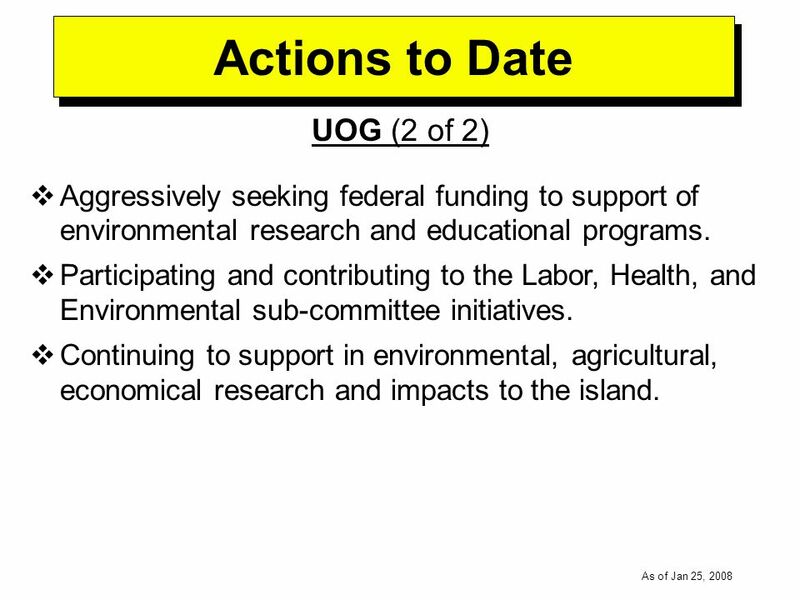 24 -----DRAFT----- As of Jan 25, 2008 Actions to Date UOG (2 of 2) Aggressively seeking federal funding to support of environmental research and educational programs. Participating and contributing to the Labor, Health, and Environmental sub-committee initiatives. Continuing to support in environmental, agricultural, economical research and impacts to the island. 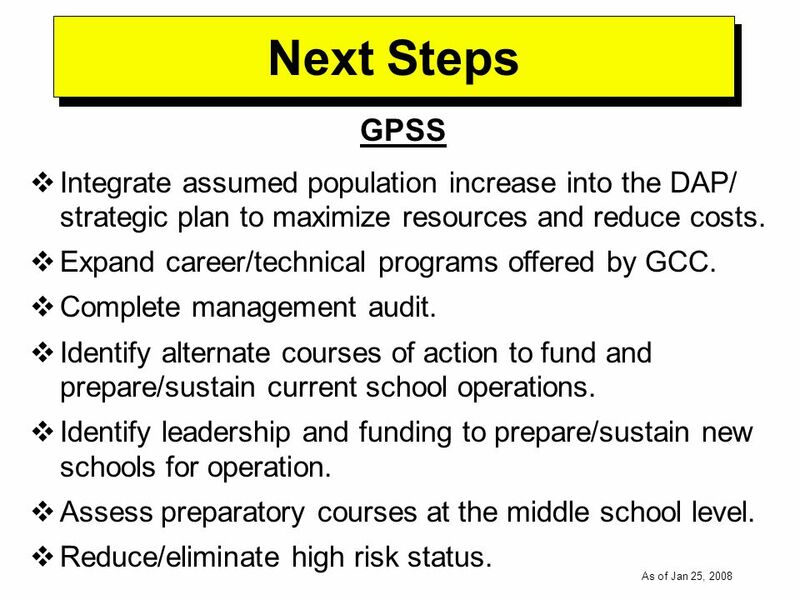 26 -----DRAFT----- As of Jan 25, 2008 Next Steps GPSS Integrate assumed population increase into the DAP/ strategic plan to maximize resources and reduce costs. Expand career/technical programs offered by GCC. Complete management audit. 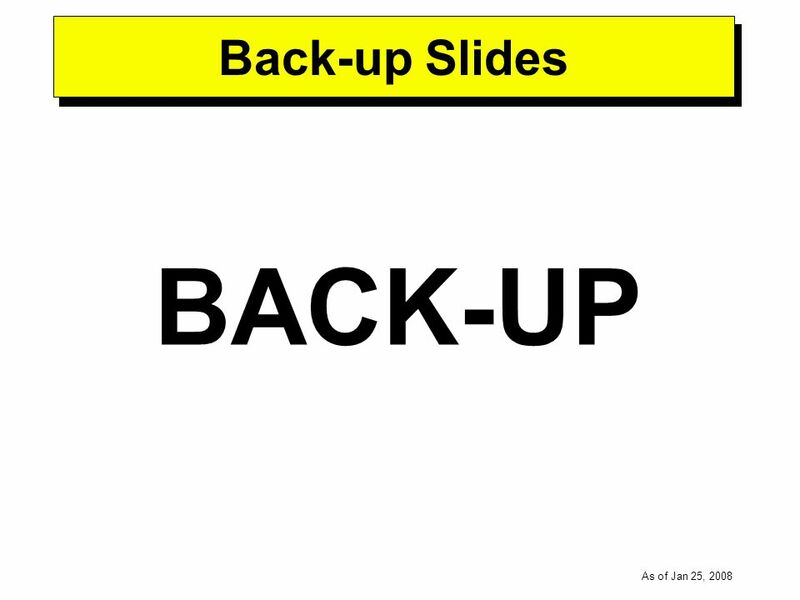 Identify alternate courses of action to fund and prepare/sustain current school operations. Identify leadership and funding to prepare/sustain new schools for operation. Assess preparatory courses at the middle school level. Reduce/eliminate high risk status. 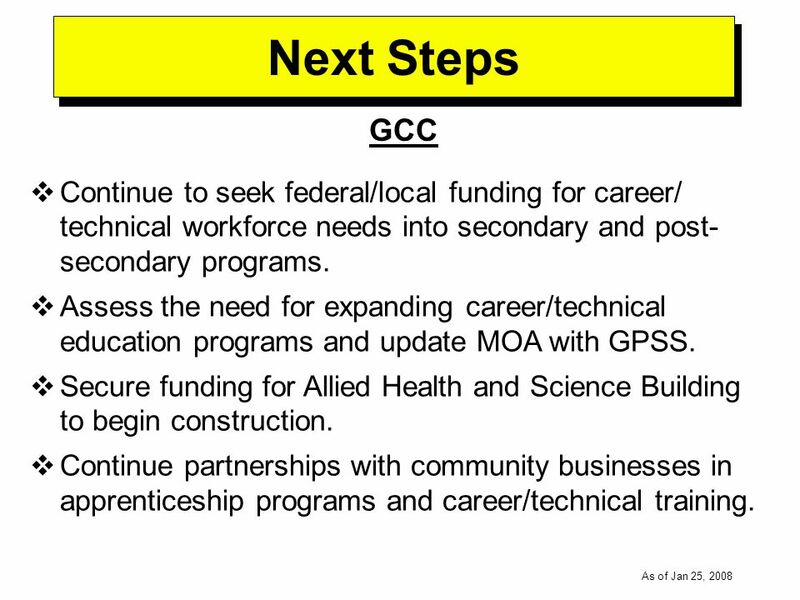 27 -----DRAFT----- As of Jan 25, 2008 Next Steps GCC Continue to seek federal/local funding for career/ technical workforce needs into secondary and post- secondary programs. 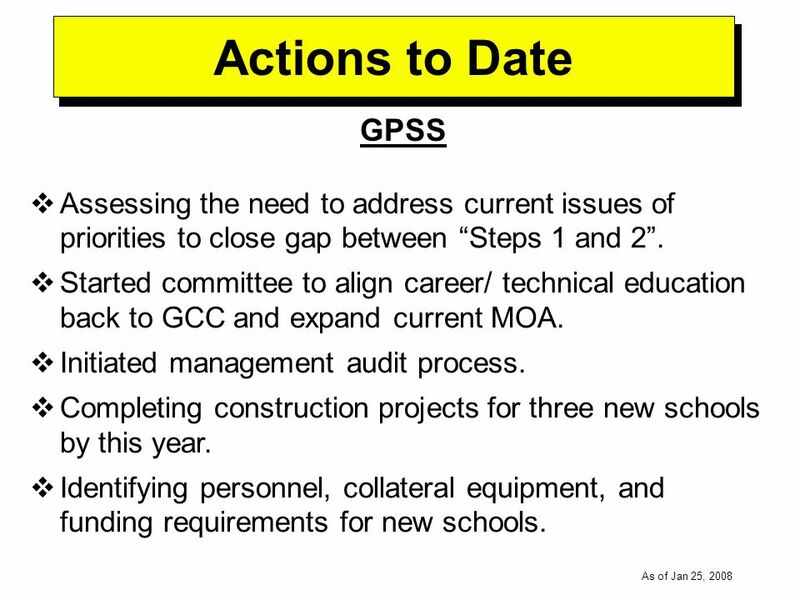 Assess the need for expanding career/technical education programs and update MOA with GPSS. Secure funding for Allied Health and Science Building to begin construction. Continue partnerships with community businesses in apprenticeship programs and career/technical training. 28 -----DRAFT----- As of Jan 25, 2008 Next Steps UOG Continue to seek federal/local funding for workforce needs, environmental assessments, and community support. Continue to assess degree programs and operations to reduce costs and maximize resources. Identify funding for the Nursing and CEDDERS buildings. Continue to expand integration of internship with community businesses and GovGuam operations. 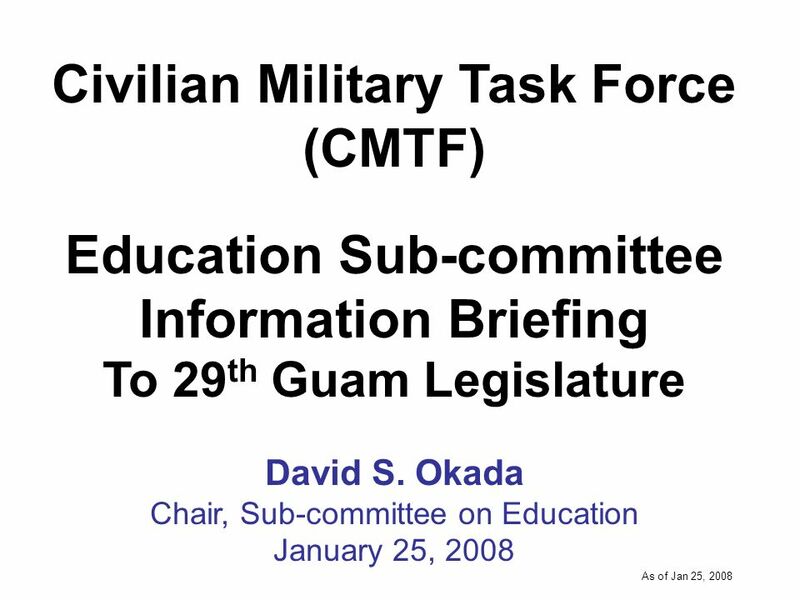 Download ppt "-----DRAFT----- As of Jan 25, 2008 Civilian Military Task Force (CMTF) Education Sub-committee Information Briefing To 29 th Guam Legislature David S."
-----DRAFT----- As of February 5, 2009 Civilian Military Task Force (CMTF) Education Sub-committee Information Briefing to Committee on Guam Military Build-up. 1 Workforce Creation and Adult Education Transition Council Correctional Education and Re-Entry Work Group October 7, 2008. The Supply of and Demand for Registered Nurses and Nurse Graduates in Texas Report to the Legislature. Allen Overstreet Bureau of Re-Entry Programs & Education Correctional Education Overview of Services. The Academic Program Prioritization Process September 2012-May 2013.